First of all, I know we don't really call it 'home school' here in the UK, but 'home education' didn't fit so well into my title, and I get it that people here will grumble about the difference so necessitating the long explanation of my snappy title. Not sorry. I see a lot of questions on forums along the lines of 'how do you home educate older children when you have younger ones demanding attention?'. I guess the answer depends so much on the dynamic in your family, what each child is like in temperament and ability and so on, so there's no easy answer. For me, I find doing as many things together as possible in a practical, hands on way that both boys can access is good with our small age gap. 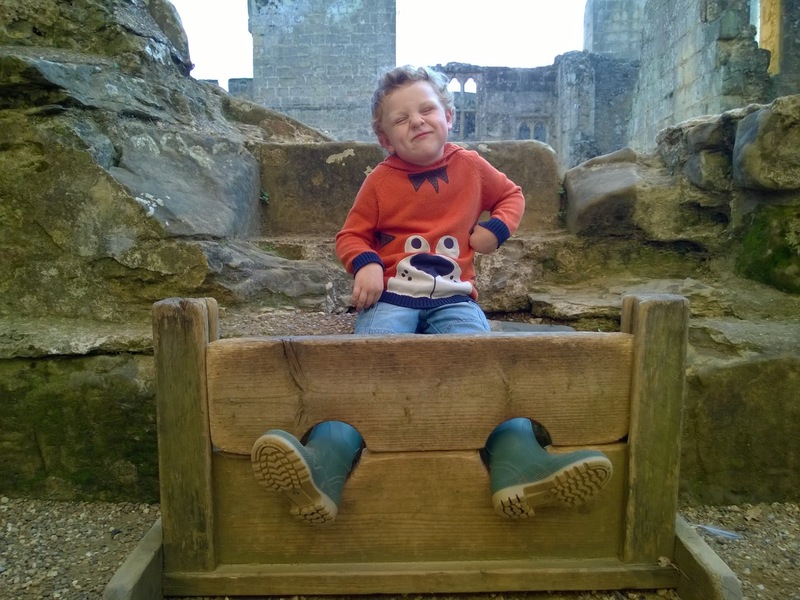 However I do spend more time on sit-down activities now that Ollie is nearly six, and this is the time that could be difficult to manage with a younger brother home. Fortunately, Toby is usually really happy to get on with his own things with a little help and guidance. I set up a little table in the kitchen next to where I work with Ollie on the kitchen table. Toby often asks for his puzzles out, and will patiently go through jigsaw after jigsaw. 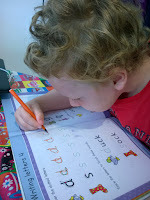 Other times he will rush to join in and do the 'school books' that he asked for, which requires more input from me in reading tasks and helping him. This is good in it's own way too though as it gives Ollie thinking time and opportunities to have a go at completing whole tasks himself - I'm encouraging him to work through things himself sequentially and check the answers together at the end, rather than pausing after each small thing and waiting for direction. When Toby has had enough of school books he might wander off to play, or will start another activity such as asking for his play dough, or paint box, or some cutting and sticking. 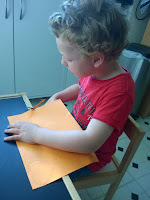 Today he wanted me to draw him some pumpkins to cut out, then stuck them on green paper. He then used the scraps from cutting out the pumpkins to make more cut and stick pictures. Having easy to access, easy to set up, easy to clean up materials is a sanity saver for this - watercolours instead of squeezy ready mix paints, glue stick instead of gloopy glue, paper and scraps ready to hand in a kitchen cupboard. Today Toby made four pictures, and after being suitably praised by Ollie and me and his favourite put up on the fridge, he decided it was time to crack on with some ironing. He cleared his table (tipped it onto the floor, but hey ho), fetched his toy iron and brought items one by one from the airing rack in the living room. After ironing a piece, he took it back to a laundry pile on the sofa and brought through another item. 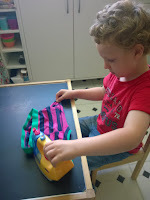 By the time he had nearly finished his ironing Ollie was done with maths and phonics and we were ready to do a couple of pages from his science book. Most of our science is practical, but we do a bit from workbooks every so often to make sure we are covering school topics. Ollie's flying through these, so although we're on 5 to 6 year old maths and phonics, his science book is 9+. I asked Toby to come and help us, as even at the age the book is supposed to be for it's just basic stuff about adaptations and food chains that Toby does well with. Toby said 'hang on, just finish this sock' and came to join us on working out which of a list of animals went with which of a list of adaptations. I showed them pictures of what the animals looked like, but they were critical of the leaf frog having skin colour to match it's environment rather than the impala since, as they pointed out 'the frog in the picture was a different green to the leaf it was on, but the impala was better camouflaged against the dry grass'. They were right, but I countered with a 'yes, but the statement says skin colour, not fur colour and I don't know what colour a shaved impala is and no I'm not going to look it up just right now'. I'm trying not to raise smart arse kids, but at the same time I don't want to go down the road of 'that's the answer they're looking for in the book, therefore that's the only correct answer' which obliterates curiosity and independent thought. Toby can join in with French too, and this was less controversial than the vagaries of the science book as we made plate pictures based on word list of foods they did with Madame on Monday. Toby showed that he grasped the essentials by asking in French for a biscuit please, which makes me think he has heard Ollie asking this repeatedly at Madame's house. He had a minor meltdown that I put the picture in his file the way up it needed to go, not the way he wanted it (despite it falling out of the plastic pocket when done his way), but was happy enough when he finally got his biscuit. We watched the kids science show Toby wanted at lunchtime, and since this was based on nice explanations of gravity and a funny story about cheesy rock monsters living on the moon, we followed up with watching a tour around the International Space Station. Toby was concerned they didn't have a proper kitchen (he loves cooking) but on the whole living in space was deemed to be 'cool' so the boys spent the next hour building a space station out of living room furniture and floating around it. 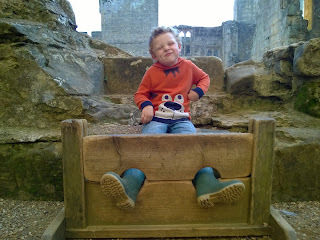 The rest of the afternoon was spent at Bodium Castle. We usually do sit down work in the mornings now, and spend the afternoon out seeing friends, at gymnastics lessons, the new sports club we've set up, the beach, the woods, play parks, castles and so on. Having memberships of NT, EH and the local aquarium is a mine of free afternoons out so long as I ignore the constant pestering for 'popping into the café for a nice cup of tea, or maybe a sandwich' (a polite request which made a lady we were walking past laugh out loud this afternoon). Having time for sit down work with Ollie was the main concern I had when Toby decided he absolutely did not want to go to nursery any more, but actually it generally works out really well. 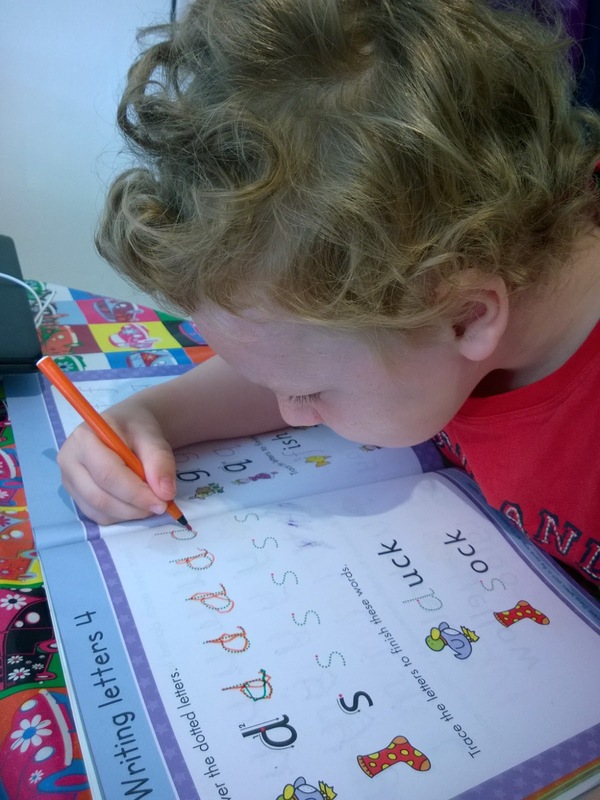 The kids see me and Matt studying, so for them it seems a natural thing to do, and by interspersing lots of short, partly self-directed activities we don't have too many head aches. I gave up on them doing separate projects that they had chosen as wrenching my head between Vikings and Dinosaurs in things they both wanted a lot of my assistance in was tough, but they both enjoy working on the projects together so it's been a good decision. I don't know what people do with bigger age gaps, but home educators (and parents in general) are nothing if not resourceful. As to when do we get any housework done, well the house frankly isn't going to show up in Ideal Home magazine, but I fit stuff in between activities, it's mostly clean and very comfortable, and one of the most important things kids need to learn is how to work as a team with their adults to look after themselves and a home. A little game they invented called 'hotel staff' was quite literally awesome tonight as they dried dishes, hung laundry, tidied and hoovered with me. After the chaos in the living room from 'space stations' I was super happy about the change of game. With a busy weekend of science parties to present and a foraging event to attend and document ahead, so I'm glad a big stack of housework isn't also on the list.